Travel with Kevin and Ruth! : Back in the mountains! What a day we had! We drove the old Espinazo del Diablo (Devil's Backbone) highway that runs from Mazatlan to Durango. There is a new toll highway that opened a year ago, but it's very expensive and apparently the road surface isn't in very good condition, so we decided to take the old twisty windy free road instead. And we're glad that we did...what fantastic scenery! But first, we had to drive the crappy dirt road out of Isla de la Piedra. 13 kms (8 miles) of hell. That section alone took us just over an hour. Started the day with hot chocolate. This is the best hot chocolate ever! We were up at 6:00am. Even though we didn't have a long distance to drive, we knew that it would take almost all day. Plus, there's a time change at the Durango border where we would lose an hour. We were aiming for a 7:00am start, but we were a little late. It was actually 7:15 when we pulled out and I took a shot of the two cruise ships that had docked at Mazatlan port yesterday morning before we left. Scenery along the old dirt road. They harvest the cocos using these long rods. Finally, we made it onto the pavement. We made our way through the small city of Villa Union, and turned east onto Highway 40. We bypassed the turnoff to the new toll highway, and found ourselves on a brand new stretch of road that lasted for quite a while. It's funny, but sometimes the free roads are in better shape than the toll roads. The road is in really good shape. But with lots of curves, it's really slow going, especially with an RV. Some of the scenery involves looking at the road itself. Here, you can see the old free road above, and the new toll highway below. The new toll highway is an engineering marvel. It is a series of 63 tunnels and 115 bridges. And the fantastic Baluarte Bridge, the highest suspension bridge in the world. A lot of the new toll highway can be seen from the old highway, including at the Devil's Backbone section itself. But it's pretty far away, so it's handy to have binoculars. One section of bridge and tunnel. This section is quite far away. Zoomed in, you can make out three bridges, and four tunnels. This section of tunnel has openings to see the scenery! It would have been fun to drive the new toll highway itself, but we can't justify the cost. Besides, as we expected there was almost no traffic at all on the free highway because most people now take the toll highway. Obviously we spent more on fuel, and it took us more time. But we think it was worth it. Another section of the toll highway crosses above us. Watch out for cattle on the road! And this section crosses below us. We had driven this highway in February of 2008 and had seen them building the new highway then. Some sections of the roadway are now more than seven years old even though the highway itself was only opened a year ago. Finally, at around 11:10am we crossed the Tropic of Cancer. We're no longer in the tropics! Sherman, parked up to see the views from "the Devil's Backbone". There were a couple of other people there who asked us for directions and we showed them our map. The Devil's Backbone is actually just a short section of highway that runs across a ridge so that you can see fantastic views off either side. And, far off in the distance, the Baluarte Bridge. Sherman, taking a break at the Devil's Backbone. Finally, we made it up to the plateau. Now, at about 6,500 feet elevation, there are pine forests and the air is so fresh. It's also much colder, and the temperature will dip close to freezing at night. Nice roads, with pine forests. We were about 7 kms (4 miles) from the small city of El Salto, when Ruth spotted a sign that said cabanas for rent. Hmmm. Maybe they have enough of a parking area for a motorhome! Here's the sign we saw. I left Ruth and Sherman at the side of the highway and I walked through the gate and down the road. Sure enough, I spotted a great spot for Sherman, with room to turn around. I found the reception building and a man and a woman were there. I told them I was looking for a parking spot for the night, and they said "sure, no problem". I asked if I had to pay, and explained that we didn't need anything but parking, and it was only for one night and we would be gone fairly early the next morning. They looked at each other and said "no, you don't need to pay anything" with a smile. Sherman, parked up for the night. They have chickens and rabbits there too! That's quite the nativity scene! Nice brightly colored cabins for rent. We got settled, and decided we had better stretch our legs. We found an old dirt road that looks like it goes for miles. Great for a hike, and I'm sure we did 6 kms (4 miles) or so. Kevin. Yep, we're in sweater and long pants weather now! Couldn't pick up an internet signal though, so we drove into El Salto this morning to post the blog and check emails. 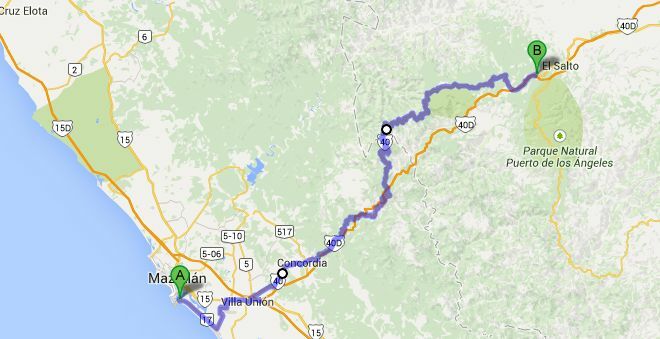 Today, we're only headed about 50 kms down the road to El Parque Ecologico Tecuan where we know that other RV'ers have spent a night or two dry camping. May not have a signal there, so if you don't hear from us tomorrow...it's because it's a nice spot and we've decided to stay! Happy 2015...it's going to be a great year! Yesterday's drive, 222 kms (138 miles). what a great drive!!! Happy new year! It sure was! Happy New Year to you as well Karyn! Great pictures. Happy New Year! Thank you! Happy New Year too, hope you had a great New Year's Eve. That new highway is awesome, and certainly nice to look at from the old road. Reminds me of some of the new highways in Slovenia. The "vignette" required to use all of them isn't nearly as expensive as a quota road though, so much more attractive to use. Happy New Year! Bundle up! We would love to drive the toll road sometime, too bad it is so expensive, especially in a motorhome. Having said that you don't have nearly the overnight options because you don't have much opportunity to get off the toll road as you have with the free road. Sorry, forgot to add in a Happy New Year to you too! Happy New Year to both you and Pam. Wishing you both the best for 2015. Thank you Helen, and Happy New Year to you and Tony! Wish you all the best for 2015. Buen Año Nuevo, Kevin and Ruth - from Valparaíso, Chile. Feliz Año Nuevo, Mary-Pat. Hope you are enjoying Chile! Happy New Years, we are enjoying the Devil's Backbone with you. Thank you George, and Happy New Year to you and Suzie as well. We think that there is just so much more to do and see in the mountains and the air is so much fresher. Happy New Year, Connie and Barry! Excellent report Kevin, thanks for posting. We'll be on our way Saturday morning. Be safe and have fun! Glad you enjoyed it Chris and it looks like you used our over night spot in El Tecuan by the sounds of things. Hope the rest of you trip goes without anymore incidents. Thank you Leslie, and Happy New Year to you as well. Ahhh, mountains! So much better than beaches. That old road behind Kevin sure looks like it could be an old railroad grade. I love bicycling those. Happy New Year! Your monthly budget posts will help me keep my resolution of much better tracking of my budget this year. We thought the same thing Dugg but it didn't have the slightly raised bed that you would normally have on an old railway trail and the rest of the "road" didn't seem like a old railway line so we aren't quite sure about that. Happy New Year to you too, Dugg! Happy new year guys! Looks like a beautiful area you're in now. Thank you Peter and it is a gorgeous area that we are in. Can't wait to explore more of it. That road is on our "List". Thanks for the tour. It is a definite "must do"!